Pork belly. Also known as pork side or middlen. The most treasured part of any hog purchase because it is used to MAKE BACON. But every now and then you have to try something new. So that got me thinking. Of course bacon is a thing of beauty, but what if I could make a similar pork belly recipe? Hello, Google…and I found Dan Barber’s Pork Belly. You do have to plan in advance for this recipe because it needs to cure for three days before being slow cooked for 7 hours, but honestly the overall time investment was minimal, making this an easy and delcious recipe. I followed the recipe almost exactly. For the cure mix, I forgot to buy star anise so I subbed dried basil because I smell anise in basil sometimes. (Don’t ask me for rational explanations.) I used ground white pepper instead of whole white peppercorns. I subbed celery seed for fennel seed. Also, I scaled back the sugar a little bit. Since I had a 3 pound pork belly and the recipe called for a six pounder, I halved the cure mix. After blending the cure mix I rubbed it all over my partially thawed belly, then packed the cure around it, wrapped it up in wax paper then aluminum foil. It sat in the fridge for a little over three days. When it came time to cook, I rinsed as directed. Since I had failed to cut off the skin before curing (duh to me, I’ll take it off first next time) I cut the belly in half and ran it through my Chef’s Choice Electric Food Slicer to cut off the tough skin. I put the two pieces fat side down in a ceramic dish, poured two full quarts of chicken stock over it and covered with foil. In it went for 7 hours. When time was up, I pulled the dish out and took a look. Not terribly impressive looking. Kind of like a huge chunk of lame, pasty bacon. Good thing I wasn’t done yet! I cut the two halves into 8 chunks each and fired up the cast iron skillet. Frying first on the fat side for 3-4 minutes until it got nice and dark and carmely and crunchy, then on each side for a minute or so until the entire small chunk was crunchy and brown. CAUTION. 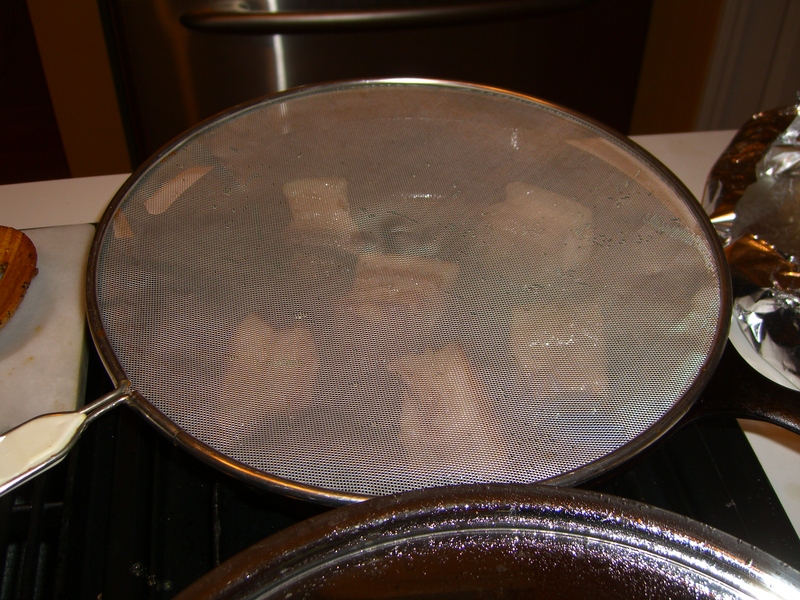 DO NOT FRY THESE CHUNKS UNLESS YOU HAVE A SPLATTER SCREEN BIG ENOUGH TO COVER YOUR WHOLE SKILLET. It WILL splatter all over God’s green earth and burn you and your loved ones if you don’t cover it up. While the pork belly goodness was frying I was also frying up some cubed red potatoes in butter with a few tablespoons of Mill Creek Spice’s Steak Seasoning. Man, is that some good stuff. Anyway, so once you have your well-crisped chunks of pork belly, drain as you please and enjoy. This made me do a dance in the kitchen, just ask Test Subject Bill. Good luck eating more than two. They are SUPER rich but unbelievably tasty. I think it might be better than bacon. But a word to the wise – make this for a crowd! This is way too much for two people and good enough to share with your best friends! 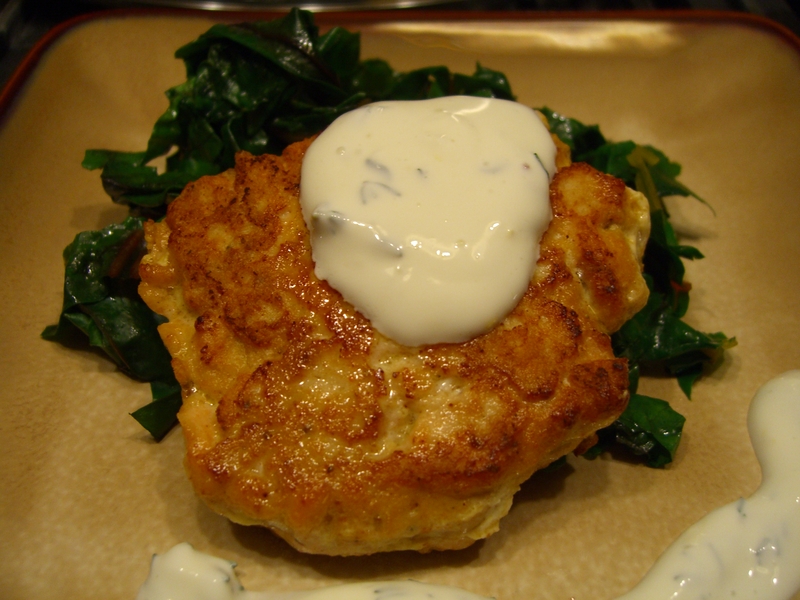 Also, consider serving with something pickled or maybe a salad with vinaigrette just to cut the richness of the fat. It is a thing of beauty. Ah, pork belly euphoria!! 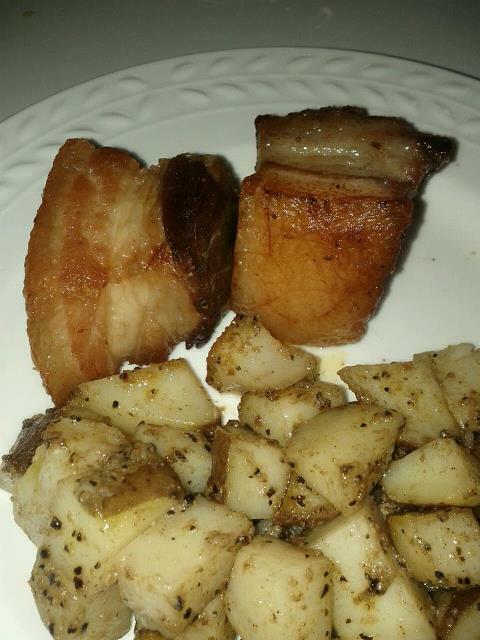 Pork belly and seasoned spuds! When you buy a Big Green Egg, it’s kind of like joining a cult. 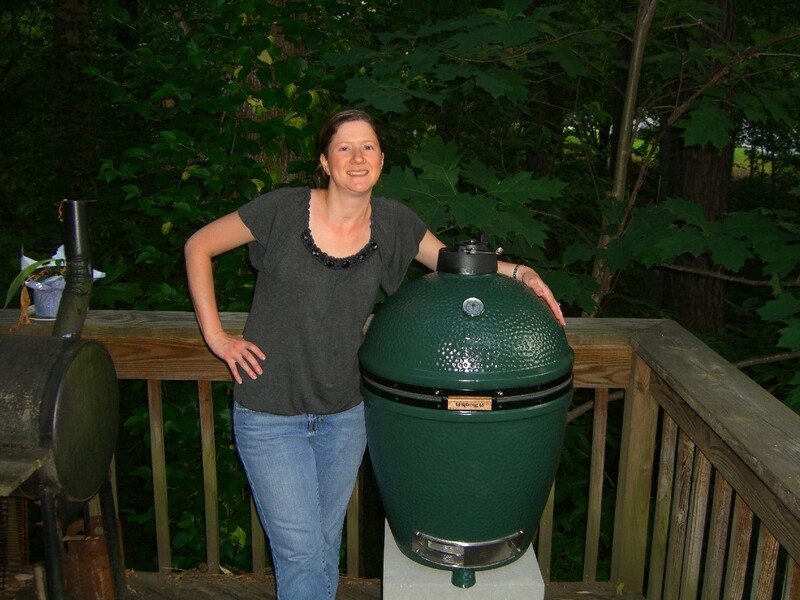 People who own a Green Egg (or “Eggheads”) become fanatical, notice other Eggheads when they drive or walk by their house, and dancing or jumping ensues just from seeing someone else’s Egg. This month, I joined the Egg Cult. The first night after a laborous process of setting up our new large Egg, I had burgers ready to throw on and french fries ready to go in some piping hot tallow. 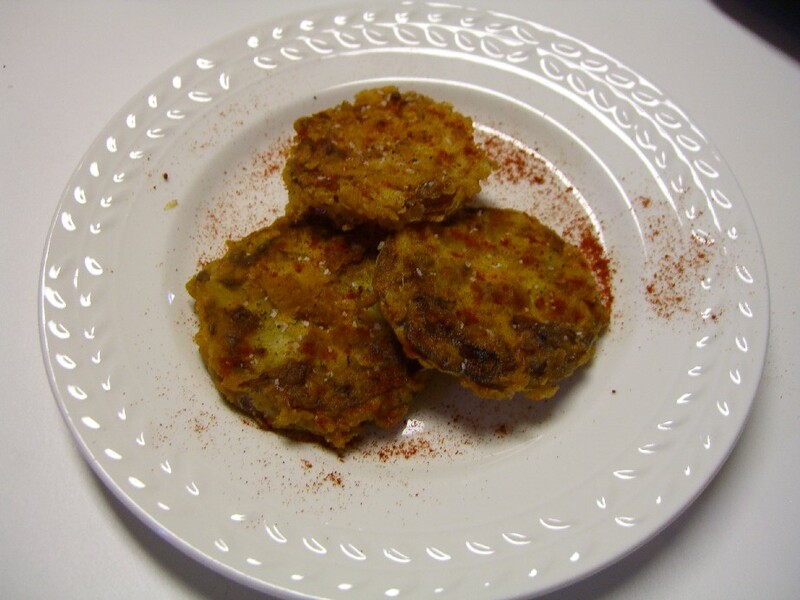 I used Cheeseslave’s fry recipe and they were out of this world delicious! And the burgers…amazing. So delicious and moist. Grass fed burger, fries fried in tallow and a naturally fermented pickle. The good life. Fajita pork stuffed peppers: brown ground pork, stir in fajita seasoning to taste and grill to perfection. Garlic pork bratwurst with carmelized vidalia onions and sweet peas. Pork loin roast rubbed with a sweet and spicy rub and cooked on the Egg using indirect heat for about three hours. 4. Fry as many as will fit in the oil, about 3-4 minutes on each side. The batter should be golden brown all over. 5. Drain & cool on a paper towel; eat warm. Sprinkle salt / pepper to taste. Makes about 25 slices, more or less. Store uneaten slices (Yeah, right LOL) in an airtight container. Reheat under broiler to maintain crispness. 6. I didn’t use dipping sauces but ranch dressing or a honey mustard horseradish sounds like a good match. I picked up a couple of green tomatoes at the farmer’s market. Unfortunately they sat for a little longer than I’d anticipated and one of them was more pink than green, but I figured it was the firmness that really mattered and it was still pretty firm. And I’m a yankee so I can probably get away with a kung faux pas like that. Since I only had two tomatoes I halved the recipe. Also, I used the lard I rendered last week to do the frying. Test subject Bill was suspicious when I told him what I was making (he’s from Nebraska…) but I was confident he would become an enthusiastic supporter once he tried them. Frying up the green tomaters.. I egged and dredged and fried the tomato slices in my cast iron skillet in about half a pint of lard, give or take. I probably could have gotten away with less. I fried them for about three minutes per side and they came out looking fabulous. On Lori’s suggestion, I whipped up a dipping sauce – just dijon mustard and local honey for a sweet and tangy zip. As the slices came out, I salted, peppered and then added a dash of smoked paprika over everything. I don’t think the flavor of the paprika came through, though, for the ones we used the dipping sauce on. However, it did make them look nice! Test subject Bill came down for a sample and walked away with half the slices. I think he liked them even better when I told him they were fried in lard. Pork fat. It just makes you smile. I do think that I overdid it last week on the lard rendering though. The porky flavor really came through more than I think it should have. Plus when I was frying I could really smell it. Next time I’ll know what to look for as far as “doneness” and take it off the heat earlier. No more lard kung faux pas for me. I can learn! 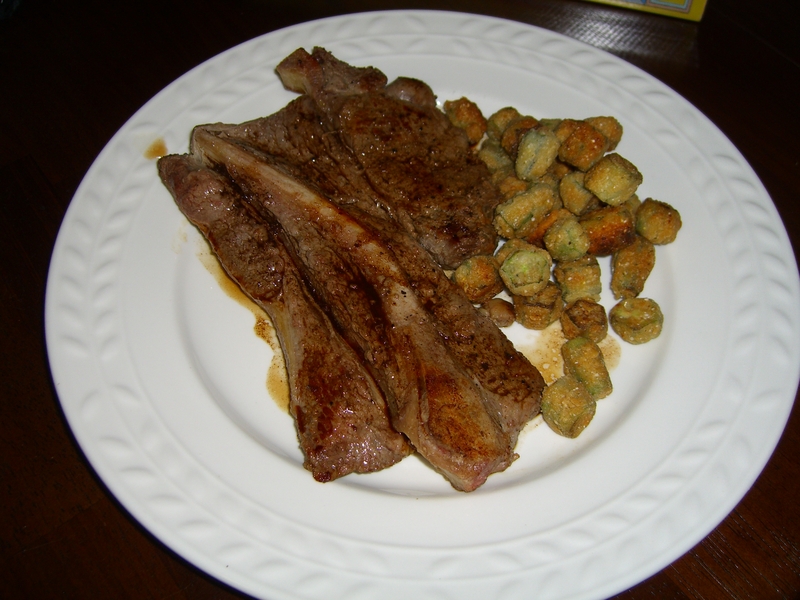 Fried okra with a rib eye steak for dinner...God bless America. Since I was frying and had all this nice lard and happened to pick up a basket of okra at the farmer’s market, fried okra was the natural progression. I did a lot of research on different recipes but settled on this one. I did end up modifying it a bit based on some other recommendations on other recipes (I used half cornmeal and half flour for the coating), but it came out fantastic! The coating totally stuck to the okra and came out crunchy and flavorful. I think even my okra-hating Dad would have loved this. 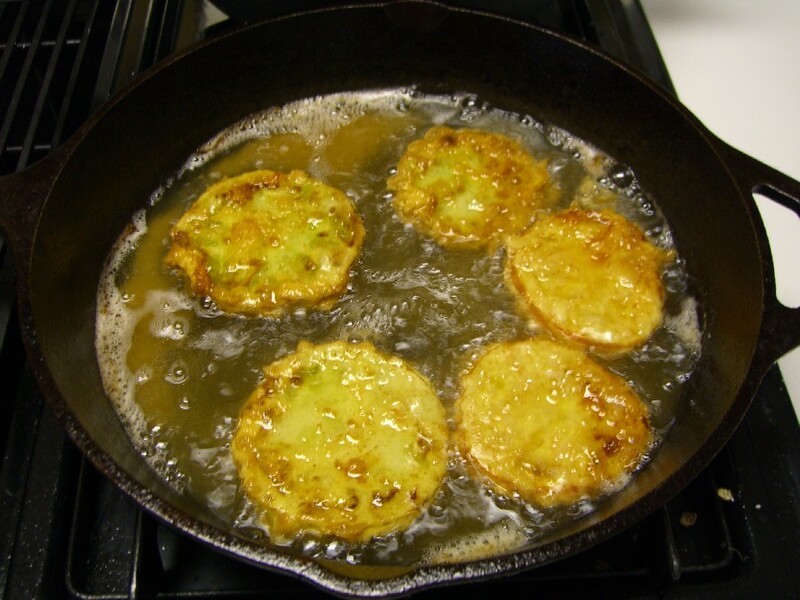 After all…what food does frying in lard NOT improve? Last week I had a produce panic attack. There are loads of goodness coming in from the local farms, and I think half of it ended up in my kitchen. Between my CSA box and my inability to stay away from the Suwanee farmer’s market on Saturday mornings, my fridge and counter tops were bursting with produce. It was time to freak out. What do I do with all this bounty?? So I got to work making squash muffins courtesy of a recipe from my CSA newsletter. Sounds weird, but they really do taste good. (Especially with butter and a little honey!) I made two dozen of those, put some in the freezer and some in bags to give to friends. Then I made a loaf of zucchini bread from my How to Cook Everything book. I’ll have to tell you how that tastes later because it’s in my freezer right now, which is just about to explode. of olive oil. Super yum. squeezing out the liquid. Next time those squash won’t know what hit them. They were fun to make, though, and it was actually my first time using coconut oil. Tasty stuff! sauce with a little water and cornstarch to thicken it up. The beef was a sirloin steak from Nature’s Harmony Farm. I used the leftover coconut oil from the fritters to do the frying. It was SO GOOD. The beef was tender, the veggies were slightly crunchy, the sauce was phenomenal. Truely, I wish this was a scratch and sniff blog with a taster option because I can’t even explain how great this smelled and tasted. And all I really did was throw stuff together. A smart cook uses good ingredients so they don’t have to work as hard 🙂 Test subject Bill went back for seconds. When I woke up this morning there was still work left to do on the produce barrel. I stirred some of the sweet and hot peppers into my morning eggs, tossed in some chopped tomato and topped it with a dallop of sour cream for a southwestern southeastern egg dish. I cut up a baby cantelopue (those things are so darn cute) and used the raspberries I didn’t freeze to make a dessert for my breakfast. (Who says breakfast can’t have dessert?) Add some toast made from Ezekiel bread from the farmer’s market, a cup of tea and a glass of real milk and that’s what I call the breakfast of champions. Wheaties is for chumps. Finally, and this has nothing to do with produce, but after all that effort I needed a sweet treat. A couple eons ago I had this Care Bear cookbook. It was filled with ridiculously sweet treats for kids to make, but the one thing I made over and over again was the Nutty Shake. It has been probably 20 years since I made one. I was due. I used some of my homemade vanilla ice cream, some organic peanut butter, milk and replaced the white sugar that the original recipe called for with honey and let it rip in the blender. I think I used a tad too much milk because it didn’t come out as thick as I wanted, but it didn’t matter. I sucked it down and was grateful. I know this all sounds like a ton of work, but I am so relaxed right now. We ate well and there’s more in the freezer for later. There’s just something about real food that makes me smile. My Korean tutor took me to the asian market one day to go shopping. While shopping we picked up a package of croaker – three whole, salted fish. They are smaller fish, but we noted that they were a lot bigger than the tiny little fishies we got in Korean restaurant. Hmmph. Anyway, I was told to rinse the fish, heat some oil in the pan and fry the fish straight up as is. Sounds easy enough, especially considering I’d never worked with a whole fish in my life. I pulled the fish out of their saran wrap prison and rinsed them as directed. The fish were firm feeling, which may be from the fact that they were salted. I looked at the hot oil in the pan and back at the fish in my hand. Just throw it in? That’s all you do? Suspiciously, I eyed the fish. No knife marks on its belly. Was this fish…fully intact? Just follow instructions, I told myself, and added the fish to the pan. I set the timer for three minutes and stared at it. I felt kind of mean, with the fish staring at me and everything. I flipped it and set the timer again. It was starting to resemble the pan fried fish I’d eaten and enjoyed at the Korean restaurant. Two points for me. Then…the belly kind of swelled and split and…I could see the innards. That was it. Apparently I’d screwed it up somehow but I was not about to eat it then, after seeing it’s intestines in the pan. I felt bad as I dumped it, since the fish died for nothing. I turned back to the other two croakers and decided I was going to gut them. Having never gut a fish before, of course I dove right in without instruction or research. I actually did a decent job on the first one even though it was a little creepy. Meanwhile, Bill did an internet search on fish cleaning and came back with a few tips for the last one. With two gutted fish ready to go, into the hot oil they went. Flipping a whole fish is a bit of a challenge. I was trying to use tongs and it worked ok, but if I do this again I’m going to want a more efficient tool. Something that will hold the fish together better. But amazingly enough, I managed to get both fish cooked and onto plates. I was a little nervous. I looked at the fish. He looked back, almost like he was irritated. You’re an idiot, he had to be thinking. What did I do to end up in your house? Tentatively, Bill and I each took a bite. That’s good, we agreed. Really good. Mmmm. I ended up devouring the whole fish with a fork and my fingers like I was starving, then looking around to see if Bill was going to eat all of his. He did. Dangit. Traumatic? Yes. Educational? Of couse. Turning something simple into something complicated? Most definately. Worth it? Yeah, baby. That’s some tasty croaker! 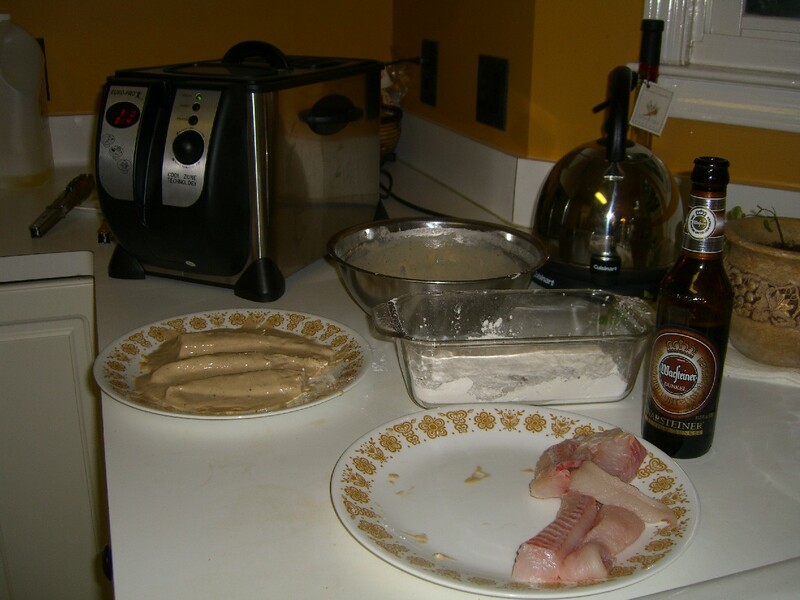 For labor day, I decided to…uh…labor…over an old-fashioned fish fry. 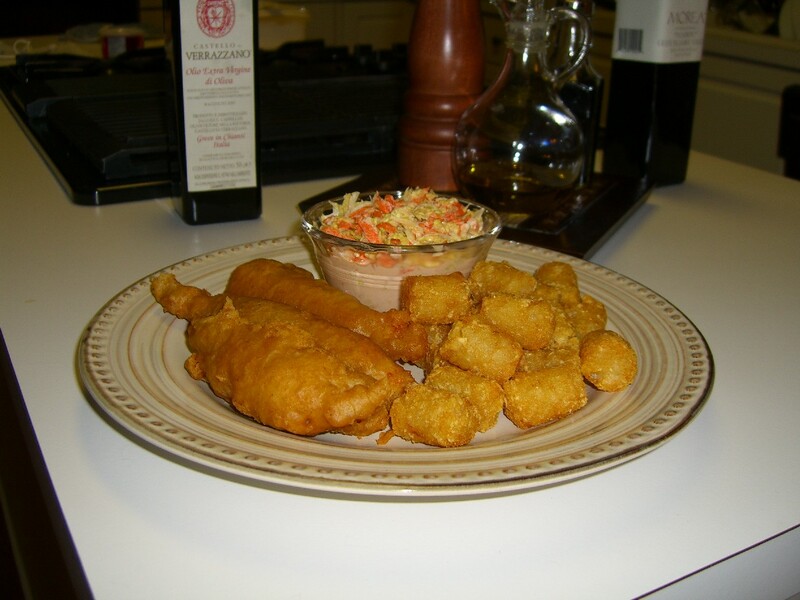 On the menu: fried catfish, tater tots and coleslaw. And beer. I didn’t make the beer. Or the tots. Sue me. First, the slaw. I used to hate cole slaw, but I recently decided I’d give it another shot and have come to appreciate its crunchy goodness. For my slaw, I made “Mom’s Cole Slaw” which I found on Allrecipes.com. I love allrecipes. I used Napa cabbage for the base. It was a bit of a pain to grate, and quite messy. But that’s all part of the fun, right? Next time I will shred it rather than grate it. It turned out a bit on the soggy side (even though I did let it drain for a few hours after grating) and I think shredding it will help prevent that. It was, however, extremely tasty and I recommend it. For the tots, I opened a bag of frozen 365 brand tater bites and deep fat fried them according to the package directions. I’ll endeavor to make my own french fries another day. Finally, the catfish. I used the fish portion of Alton Brown’s recipe for Chips n’ Fish (he’s my hero, after all). This is where Kung Faux Pas #1 comes in. This recipe is a batter fry. Do not lay batter-laden fish strips in the fry basket and lower them into the oil. I ended up retrieving a basket with fish completely adhered to the bottom and sides of the basket like that’s the way God wanted it to be. Being the crafty girl I am, I decided to ditch the basket and just fry it straight in the fryer. Kung Faux Pas #2. This probably voided my factory warranty (it does specifically say not to do what I did). It ended up working, however every now and then a fish would get stuck on heating element at the bottom of the vat (probably why they say not do it) and I’d have to knock it off with my tongs. This is likely not good for the fryer and is something I don’t recommend. That said, the fish ultimately turned out golden brown and delicious. We enjoyed our fish fry with a nice cool one (as evidenced in the fry station photo) and basked in the fruits of our labor.